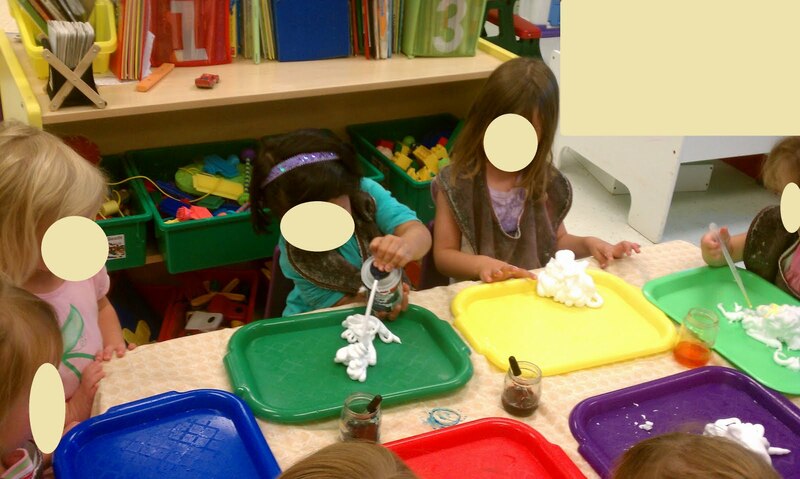 Play-Based Classroom: Mixing Colors With Shaving Cream! Someone once asked me what do I do when the daily routine "falls apart?" In a classroom of three year olds, this is a valid concern. My threes have been known to send teachers out of the room crying (myself included)! 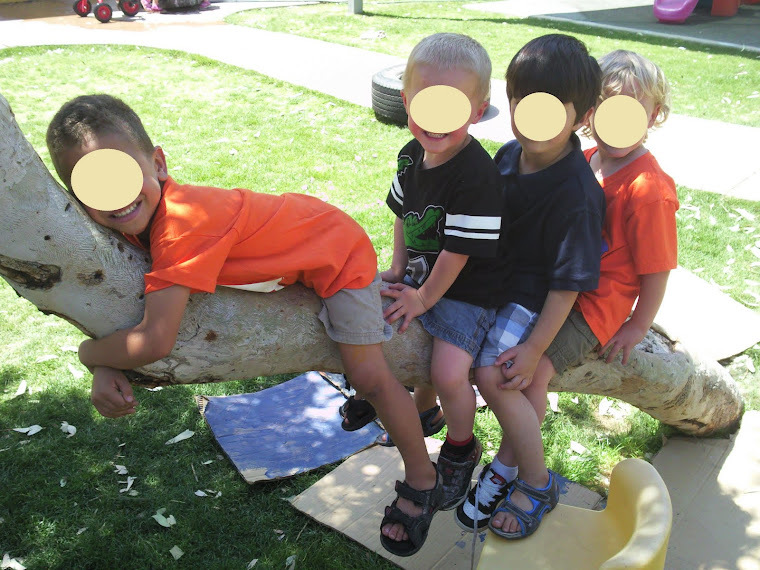 I don't blame them...they are three, and act accordingly. When you put twenty 3 year old children in a room, there is bound to be some drama, no matter how wonderful and patient the teacher is. 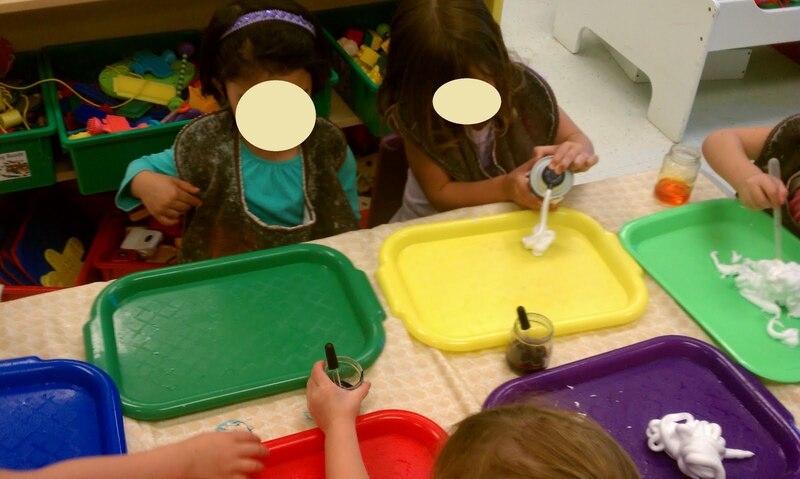 I always fall back on providing sensory play. In my classroom, the sensory tub is always filled with something interesting to pour and fill. 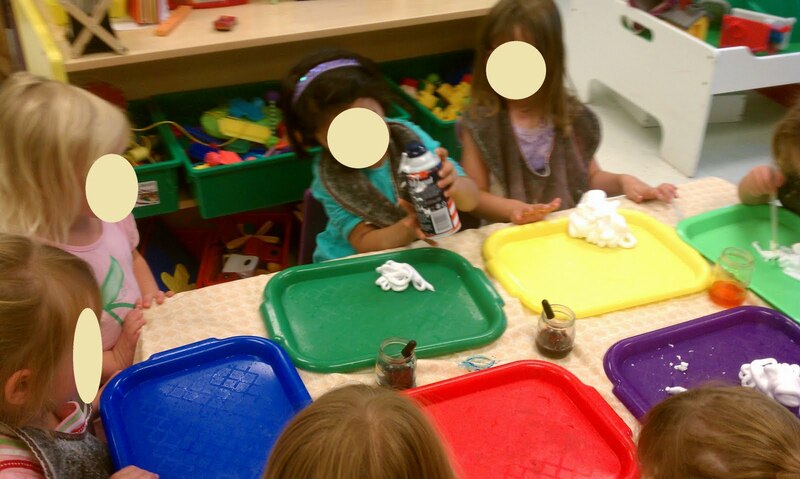 Art center has materials including paint and glue available at all times. Finally, at the table, I usually put out either flubber, playdough, wikki stix, or shaving cream. 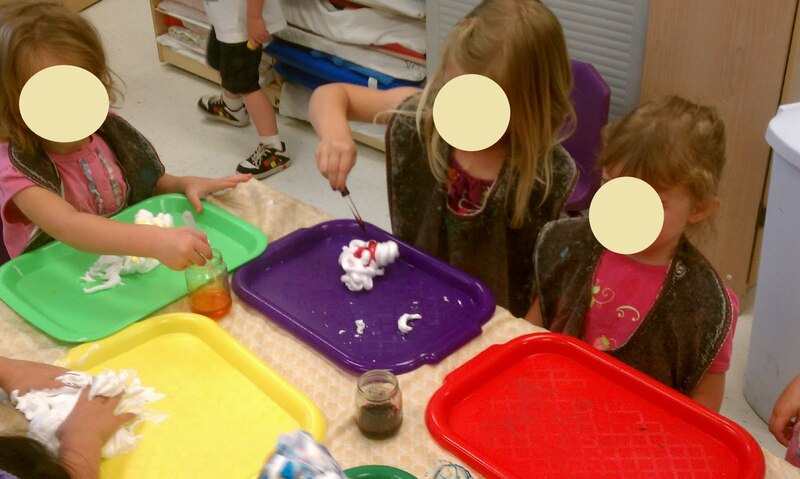 I try to make sure to have at least a couple cans of shaving cream on hand. There is something innately soothing about rubbing your hands in a fluffy mountain of shaving cream. When you rub it on the tops of your hands, it almost feels like a massage. No wonder so many children rub it on their arms, faces, hair, and bellies (oh, yes...I said bellies)! 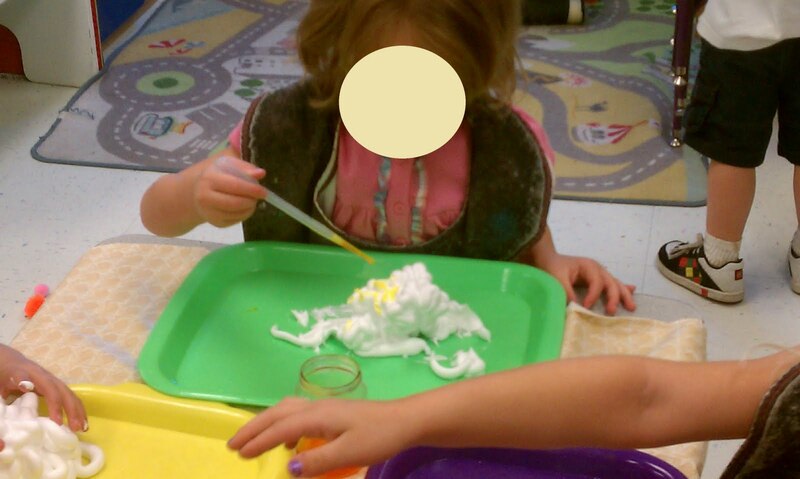 Now I usually squirt the shaving cream for the kids, and then let them "go to town." This has worked beautifully for me in the past. This time, I just put the can out, and watched to see what they could do. It was funny watching them stare at the can, then at me for a few minutes. I didn't say anything...just waited for someone to be brave enough to try it first. Of course, as soon as she did, I heard, "MS. GINA...SHE TOUCHED THE CAN!" Expecting it, I nodded, and said, "It's okay. You can try it yourselves." It can be pretty tough to push the button down hard enough to make anything come out. Here, you see Sydney give Emily a helping hand. I also utilized the baby food jars as paint holders. I put out red, blue, and yellow liquid water colors for some real color mixing magic. I also put out eye droppers, which are great for gaining small motor control. 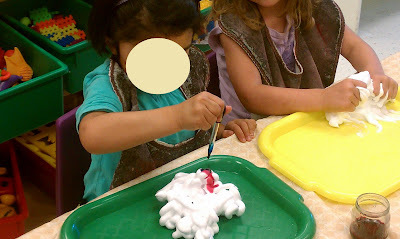 They had to wait turns while the shaving cream was passed around. Next time, I'll put out two or three cans to minimize wait times. This time, they did pretty well waiting. Sometimes, it took a few tries to get it out. 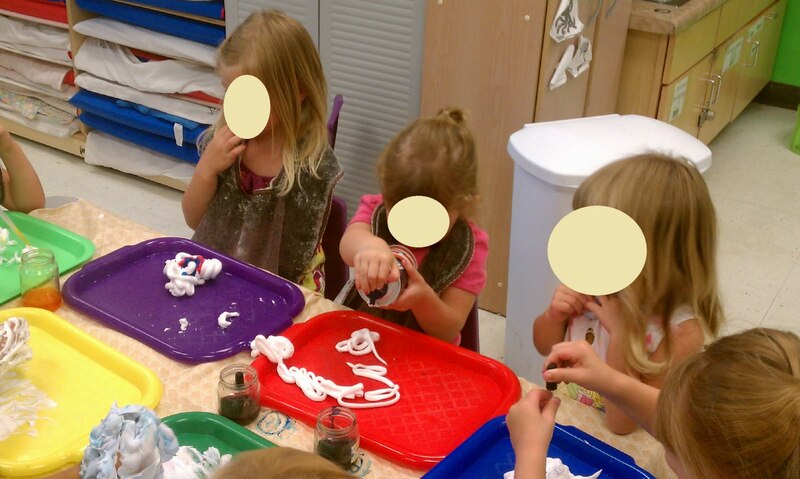 I doubt the next time they will have as much trouble getting the shaving cream out on the first try. 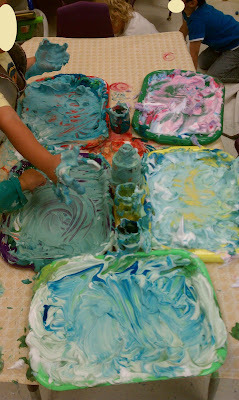 I think that everyone needs sensory play!!!! 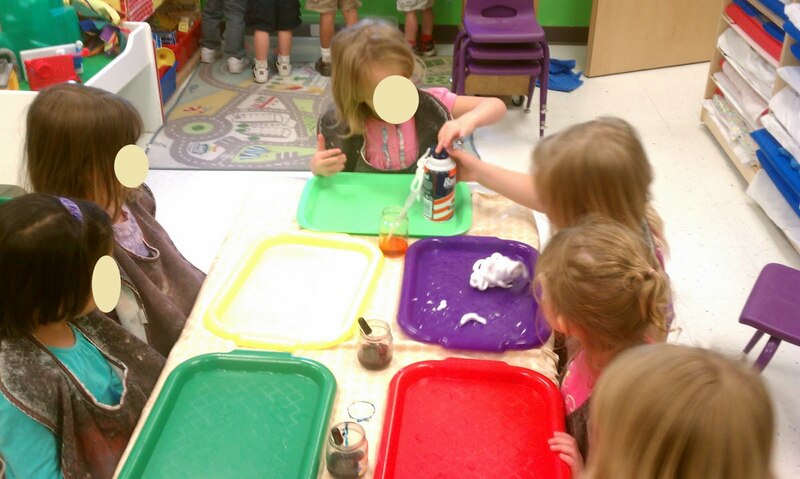 I love that you let them use the can themselves, and you can tell that they really enjoyed this experience.